The global mining industry has seen drastic improvement over the past couple of years, having endured a prolonged sluggish period in the wake of economic recession and financial crises. The progress of mining industry depends mostly on the GDP trend. Moreover, burgeoning demand for minerals across the globe along with the prices of metals reaching a stable point is anticipated to push the mining industry towards growth over the coming years, which in turn will benefit the global mobile crushers and screeners market. Till date, Asia Pacific is among the prominent regions in the mining and construction equipment industry. Construction and mining equipment sales in China are expected to increase significantly over the course of the forecast period owing to the upsurge in construction activities and mineral production in the region. 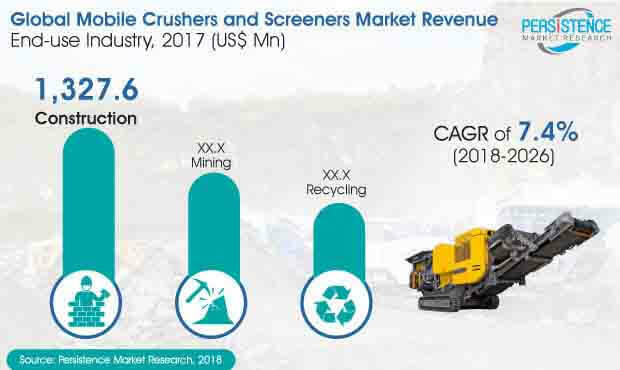 Sales of mobile crushers and screeners in China and India are expected to increase over the upcoming years, owing to increasing government initiatives towards development of highways, and infrastructure, among others, which increases the demand for construction aggregates. Increasing consumer eagerness to own a house is estimated to drive the residential construction sector, which will increase the demand for construction aggregates. This will further propel the demand for mobile crushers and screeners in the U.S. market over the forecast period. The housing demand has been constantly on the rise post-2009; however, newly constructed household units do not seem to suffice the demand, creating a huge supply-demand gap. This gap has been leading to escalated home prices and rents, which is identified to be a continuing trend impacting the market performance in the absence of imminent policy changes. Moreover, ongoing infrastructural development projects in developing regions has also increased the demand for mobile crushers and screeners. Governments of India and China are emphasizing on infrastructural development. Under its latest five year plan, China is focusing on developing new highways, airports, and oil and gas pipelines. In the coming years, Persistence Market Research expects massive development in construction of roads, buildings, and bridges across India, which is likely to provide traction to the growth of screening and crushing equipment industries over the forecast period. There has been significant investments in the region, especially in Eastern Europe, for the development of the mining sector. Russia has been a major focus of investors as the region has huge reserves for the extraction of various kinds of metals and nonmetals. Moreover, the government in the region is also paying significant attention to the GDP from the mining sector. Furthermore, increase in demand for precious metals and coal will further drive the growth of mining companies as well as increase the demand for mining equipment. Over the recent past, mining activities have risen significantly in Europe. The growth in mining activities has resulted in growing demand for mining equipment, such as mobile crushers and screeners, in the region.